BicycleFriends.com: 74 Year versus 40 Year old Triathlete - Interesting Read!!! 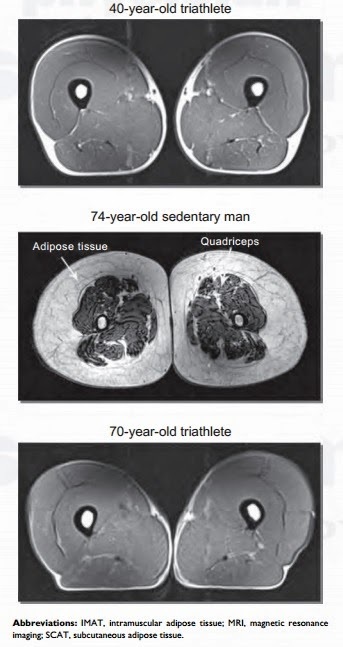 74 Year versus 40 Year old Triathlete - Interesting Read!!! The image below is a cross section of a 40-year-old triathlete's legs and the associated muscle. But the two images below it are the really interesting and telling ones. "It is commonly believed that with aging comes an inevitable decline from vitality to frailty. This includes feeling weak and often the loss of independence. These declines may have more to do with lifestyle choices, including sedentary living and poor nutrition, than the absolute potential of musculoskeletal aging. In this study, we sought to eliminate the confounding variables of sedentary living and muscle disuse, and answer the question of what really happens to our muscles as we age if we are chronically active. This study and those discussed here show that we are capable of preserving both muscle mass and strength with lifelong physical activity." "The loss of lean muscle mass and the resulting subjective and objective weakness experienced with sedentary aging imposes significant but modifiable personal, societal, and economic burdens. As sports medicine clinicians, we must encourage people to become or remain active at all ages. This study, and those reviewed here, document the possibility to maintain muscle mass and strength across the ages via simple lifestyle changes." Catching up with John P.